Online maps are undeniably useful, but scrolling in and out to see the full picture can be far too time consuming, especially when using them on a mobile phone with a slow connection. Japan's Alps Mapping may have the answer and, rather surprisingly, it's fish shaped. The cartographic company's Fish-Eye mapping service allows users to click on any part of a map for a close-up view of just the surrounding area as if seen through a fish-eye camera lens. As the data from the more detailed map is loaded at the same time as the large-scale view, the magnified view appears instantly, which - Alps says - makes it ideal for mobile users. 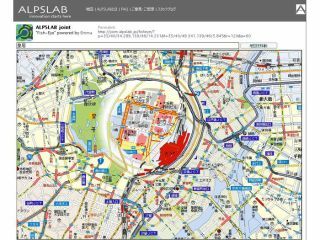 Although the current prototype service is available only in Japanese, it's clear how useful the approach might be when searching through a particular neighbourhood. Road and rail links are preserved across the two sizes of map by bending them to fit the curvature of the virtual lens. This maintains the location context that a simple zoom-in on one part of a map would lose.